Lakeside Meadows, a subdivision built in 1995, on an approximately one hundred acre hayfield, abuts Lake Nabnasset and Shipley Swamp. Because of the sensitivity of the land, so close to water, the subdivision was carefully planned to retain as much open space as possible. 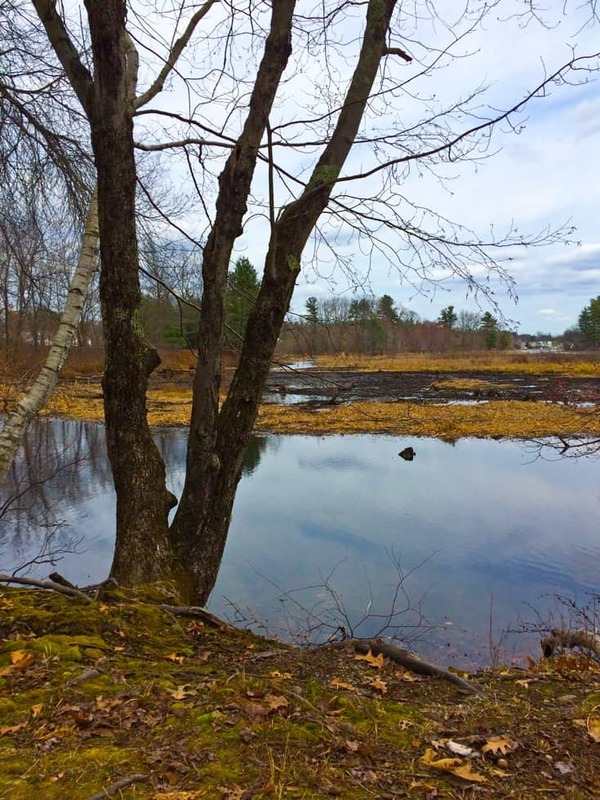 Lakeside Meadows includes sixty-eight acres of conservation land, administered jointly by the Town and the Westford Conservation Trust. Much of the open space serves as a buffer along the lake and swamp. A trail system connects various portions of open space. Several of the larger conservation areas of grassland are left unmowed during the summer, to encourage grass-nesting bird species. Numerous nesting boxes are maintained by the residents for nesting bluebirds and tree swallows. Entering the subdivision by Lakeside Terrace off Depot St., one passes by several trailheads, marked by routed posts. These posts were carved and installed by boyscout Evan DeTolla. Just past Gooseneck Lane, on the right, is a short trail called the Nutting Trail. It leads from Lakeside Terrace on a steep climb up to Nutting Rd., through a white pine forest. A bit further along on the left, one passes by an approximately half mile trail called “Shipley Trail”, which leads uphill and ends at Depot St. This trail winds steeply between and behind houses, and through a small boulder-strewn forest. Continuing along Lakeside Terrace, one reaches the trailhead for the “Estuary Trail”. This is my favorite walk at Lakeside Meadows. It is a perfect, wide trail for families, introducing children to the wonders of nature, for people recovering from illness or surgery, or for anyone who wants a short walk in an idyllic setting. The Estuary Trail is an approximately half mile trail that hugs the boundary of Shipley Swamp. It is mostly flat and easy walking, and it is one of the “birdiest” place in Westford, especially in May when this mixed deciduous woods abounds in many species of migrant birds: Baltimore orioles, warbling vireos, all the various warblers which pass through Westford, as well as representatives of most of our resident birds. Red-winged blackbirds nest in the cattails, loudly proclaiming their territories. 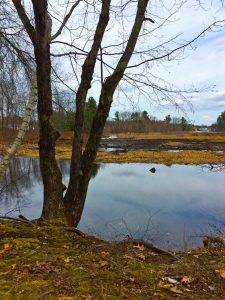 Turning right on the trail, one can see a beaver house on the bank, and in the evening experience the slap of a beaver tail on the water or the evening sounds of spring peepers, green frogs and bullfrogs. Some of the trees have been fenced off to protect them from hungry beavers. Look for the constant presence of one or more great blue herons fishing in the swamp, as well as for the often seen green-backed heron. Dabbling ducks and geese are common here too. You can proceed on this trail to reach a lovely granite bench mid-way along, where you can sit, admire the water, meditate, and feel the peace of this place. Continue past the bench up a short hill, and around the second half of the swamp. At the end of the trail, you will see another trail leading to the right that will take you out to Lakeside Terrace. You can then turn right and take the sidewalk back to your car, or turn left, for a short distance, and look to your right and across the street for the Shipley Trail marker. Turning left on the Estuary Trail, you can cross a bridge and reach the “Beach Path” which leads to the beach on Nabnasset Lake. Walking along the beach, you can follow the “Birchwood Trail” up to Birchwood Drive. From Birchwood Drive, you can walk up to the old trolley line, and have a pleasant walk following it in either direction.